Allow me to introduce a writer who needs no introduction, corny but true. Adichie burst onto the literary scene with her debut novel Purple Hibiscus (the coming-of-age story of a young girl who lives under the shadow of her fanatically religious father) winner of the Commonwealth Writers Prize was hailed by the Baltimore Sun as “one of the best novels to come out of Africa in years” by the Boston Globe “prose as lush as the Nigerian landscape it powerfully evokes”…yes it is THAT good. With all this praise heaped upon her, her third novel was always going to be tricky. The critics have fallen in love with her graceful storytelling and character insight. The Thing Around Your Neck is a volume of twelve short stories which explore the collision of the Nigerian and American cultures and the lead characters as they try to reconcile them. Majority of her narrators are young and female. The title story exemplifies her prevailing theme of homesickness. Turning it almost into a physical illness, “At night, something would wrap itself around your neck, something that very nearly choked you before you fell asleep.” it is here that the Thing Around Your Neck is shown as choking loneliness that renders you silent and invisible, not jewellery for your throat…like I originally thought. Being narrated in the second person makes the story poignant, heart-wrenching in its sorrow and longing, the use of “You” instead of “she” makes the story personal. The unnamed 22-year-old narrator gains a longed-for American visa and goes to live with her uncle’s family in Maine. “They spoke Igbo and ate garri for lunch and it was like home,” recalls the girl, “until your uncle came into the cramped basement where you slept and pulled you forcefully to him, squeezing your buttocks, moaning… And you remembered what he said, that America was give-and-take.” As a result she has a hard time believing in the sincerity of a young white man's affection for her, looking for any signs of a condescending or patronizing attitude. 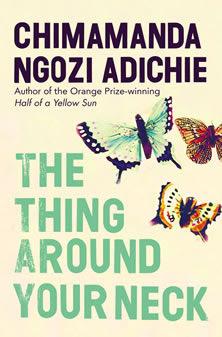 In “Cell One” the first story in the book, Adichie will refer to the coming-of-age story telling that she adopted for Kambili in Purple Hibiscus and you feel the exasperation of the young girl towards her older charming brother, as he is spoilt by his mother until he experiences a life changing situation. In “A Private Experience” a medical student hides from a violent riot with a poor Muslim woman whose dignity and faith force her to confront the realities and fears she’s been pushing away. There is an instance when the older Muslim woman prays for Chika the protagonist of the story, “Allah keep your sister and Halima in a safe place,” Chika will nod in response because even with her foreign influence and exposure she was unsure of what Muslims say to show agreement, certain only that it wasn’t “Amen”. In "Jumping Monkey Hill," a Nigerian novelist attends a writer's workshop given by an eminent, white, British scholar, where they each are to write and present a story. The scholar turns out to be the type who knows more about Africa than Africans- or he would like to think. He criticizes one person's work because stories about homosexuals coming out to their families aren't representative of "the real" Africa. This has been reported as being the most autobiographical of all the author’s stories. The last story “Headstrong Historian” is my absolute favorite. A masterpiece, the greatest short story ever told. Infact my major compliant is that it was not drawn out to blossom into a full novel, it certainly has the potential. It is pure genius, for the entire duration you are left just in awe of how the author zips between timelines and locations all the while never compromising on dialogue or scenery. It is a melting pot of colonialism, Western education and Christianity in a tiny Igbo village as narrated by Nwamgba. This lady has to be amongst my top 5 heroines of ALL time. Her wit, self-belief, survival instinct, stubbornness, and fierce protection of her family are traits to pray for. She fell in love with her husband at first sight and never stopped loving him. She pushes her son to learn to read so when the time came he could defend his inheritance from his leech uncles. As Anikwenwa drifts further away condemning her nakedness and refusal to eat her food, she wonders if “she meddled with his destiny” A love story in reverse, Nwamgba passes on her knowledge of her world to her granddaughter, the only family member eager to learn clay pottery and poetry that involved the traditional call and response. Adichie’s gift is her ability to manipulate language almost invisibly and with deceptively effortless grace she moves between Igbo and English. Her stories are also immediately intimate, absorbing you into their imagined world because she inspires the readers’ confidence with only a few sentences. Although some of these stories, feature women in circumstances that cry "victim", none of the women are drawn as such. They might have to do things they don't like, or compromise about certain things, but so does everybody else. Not once do you ever get the feeling that any of Adichie's characters have been created as deliberate objects of sympathy. What's even more refreshing is that her characters are neither victims nor super heroes. They are humans dealing with situations that come up in their lives just like we all have to. In circumstances we can identify with and emotions we can experience. If there are flaws in the collection they are minor faults of structure – a couple of stories simply stop, rather than reaching a conclusion, while the compression of the final narrative, “The Headstrong Historian”, is so intense that it feels as though it should have been allowed to blossom into something longer. Purple Hibiscus was about freedom, and the blurred line between childhood and adulthood; Half of a Yellow Sun was about moral responsibility, love and betrayal during the Biafran war; The Thing Around Your Neck is all these and more. Chimamanda Adichie produced a melting pot of stories and a work of genius. The sort of book that I am positive will make more sense and increase in depth the more times I read it. That is timeless art. I have not read the third installment, can u mail it to me hun. If ur done readin it? I promise to mail it back to u.
i loved this book too...I really wish i could write like Chimamanda because she does it well! Its $16 on Amazon but I'll read other books (have a handful of unread ones that just arrived the mail) then wait till 'Thing Around...' is cheaper. Helon Habila (from Gombe) was getting some buzz a few years back. He is the Northern Chimamanda and we need more Northern based writers out there. I just finished one of his books. 'Mrs. Club' by Ekene Onu (quite stale but I just bought it now) and 'Say you're one of them' by Uwem Akpan (Oprah book club's latest) he was my teacher in secondary school. lol! I know shona, as in she writes like Achebe no doubt, i think they should check thier blood line, they must be related! And Ladi, I did a review for the Mrs Club already so check it out. I also have both books by Helon Habila but I havnt read them yet. As soon as I do, you know I'll put a review up for you guys. And look for used copies of the book, they are as cheap as £5 here!! Chimamanda remains an inspiration. I hope to meet her someday. I've read more than half of the stories online so didn't feel like getting the book. With this rave review, I just might. Well done. I'll search for Mrs. Club then. Plan to read it next month during Thanksgiving break. I got Helon's books for like $6 so yea, used books rock deffo!